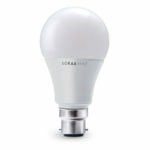 The SORAA Vivid A60 B22 Led Bulb is perfect for home lighting and outdoor fixtures. Providing energy savings as well as accurate colouring rendering, differentiation of all shades of white and dimming compatibility. The Soraa brand is a market leader in lamps for professional environments where the best quality lighting is key. We can now offer you this quality of lighting for your home. The Soraa Vivid A60 led Bulb is designed for general home lighting, decorative and outdoor fixtures. The Vivid colour range provides beautifully accurate colour rendering having a rating of 95 on the colour rendering index (CRI) – to put this into context true colour seen in sunlight measures 100CRI. In addition, the Natural White technology replaces UV radiation with harmless violet light. Allowing differentiation of infinite shades of white the same as you would see in natural sunlight. The Soraa Vivid range delivers exceptional energy savings, at a wattage of only 11W this is a perfect replacement for all standard incandescent A60 bulbs. This product works with both leading and trailing edge phase cut dimmers. A list of compatible dimmers and transformers can be found in the downloads.